A fundamental tool used by both businesses and individuals to manage certain types of risks and contingencies is an insurance policy. There are many types of policies -- home, life, renters, travel, to name a few -- and a number of issues to clarify before you make investments in such policies. Here's a good article on usa.gov that discusses how to examine options for various types of life insurance policies. I carry homeowners and life insurance, happily. 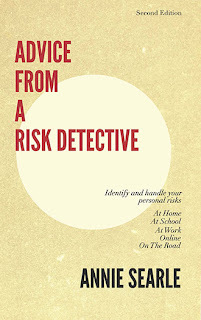 We were saved from financial oblivion by the insurance policy that we had in our home in upstate New York when the top story of the house burned off -- you can find the whole story in the first chapter of Advice From A Risk Detective. I calculated the amount of life insurance I carry by including the remaining balance on our home mortgage as well as few other charitable gifts I wish to make when I die. And when I travel, I almost always purchase travel insurance -- a small price to pay against the chance I will be unable to fly when you calculate today's costs of cancelling a ticket.